Narration is one of the most powerful tools in writing. Used properly, the narrator (or narrators) of a story serves as a conduit between the author and the reader, doling out important information and sometimes even speaking directly to the reader. Narration can be omniscient or subjective; subtle or blatant; relatable or not. Skilful narration can truly make a reader see the world through someone else’s eyes. There are as many forms of narration as there are books. I’d like to see the world through his eyes. It has been a rare, snowy weekend here in London. Most years, snow is rare, even in the dead of winter. Last year, I don’t think we got more than a few snowflakes that failed to stick. But Friday and Sunday were both delightfully snowy, leaving quite a few inches on the ground. 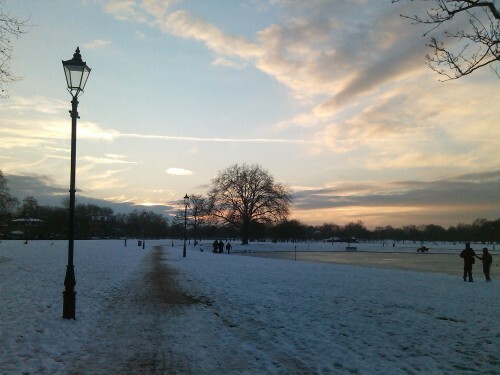 Clapham Common, just before sunset. Both children and adults were out in droves, making snow angels, snow men (and more adult-themed snow-sculptures, ahem), and generally having a blast. I know it’s a bit late to be writing a New Year themed post, but I’m nothing if not an iconoclast. This year, I had the distinct pleasure of spending New Year’s Eve in Edinburgh, and taking part in the Hogmanay festival with my husband, my sister-in-law, and one of our good friends. 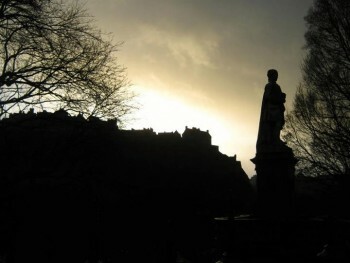 Edinburgh Castle, seen at sunset on the last day of the year. At the stroke of midnight, with fireworks filling the midnight sky with light, the familiar strains of Auld Lang Syne filled our ears, sung from a thousand nearby throats. We sang along, filling the lines we didn’t know by heart with ad-libbed gobbledegook. Back when I was a semi-avid rock-climber (which mostly involved sitting around and watching more talented climbers climb) I noticed that climbers would refer to beta when discussing climbing routes. As the story goes, the term originated from one famous climber, Jack Mileski, in reference to an old videotape format replaced by VHS. The other day was absolutely beautiful in London. I found that I was physically incapable of staying inside and writing while precious daylight seeped away, so instead I put on my coat and hat and gloves and boots and made the trek into the city. It was the perfect kind of winter day; cold and crisp with a pristine blue sky stretching into infinity. Are My Characters Too Real? Today I read a clever essay by Chuck Palahniuk (author of Choke, Fight Club, and many other gems of modern literature) called 13 Writing Tips. As the title suggests, the essay deals with thirteen of the things Mr. Palahniuk finds most useful when writing, revising, and reading his own work. I found the essay engaging and constructive, but it wasn’t until I reached Number Eight that I really started to think about how the tips applied to my own writing. I read that suggestion and physically reeled, a bit. Change my characters’ names, Chuck? Delete my characters? Surely you jest! Where is the wonder, I wonder? Do you remember the way you felt the first time you visited a new place? Somewhere beautiful, or interesting, or so new you could hardly bear it. Do me a favor, and think about that place for a moment; really think about it. Conjure it up in your mind until you can see every detail, taste the scent of the air in the back of your throat, hear the small sounds that are everywhere.